Register Early to Save More! Register by April 22, 2019, to receive the discounted price. Payment must be received by March 31, 2019, to receive special pricing. If payment is not received by due date, AME will reissue an invoice at the price level currently being offered. All multiple registrations are invoiced at the AME member price. 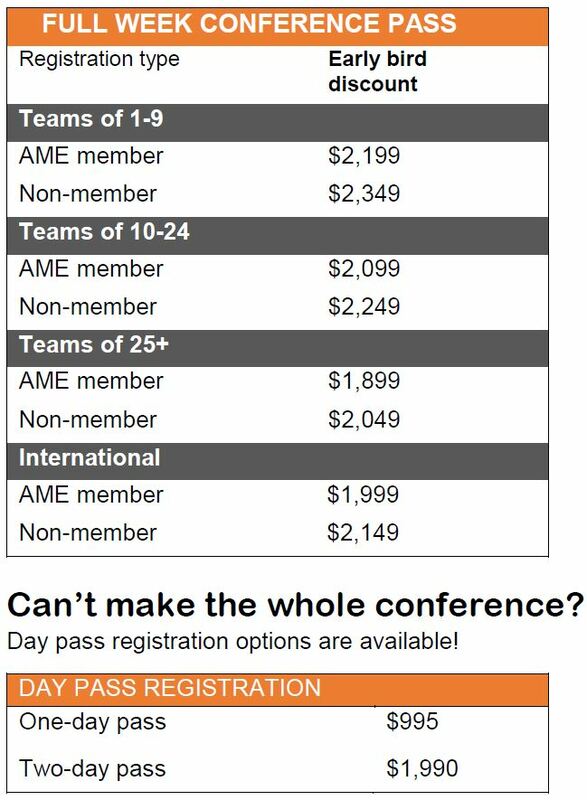 An additional $150 will be applied to an individual registration if it is confirmed that the attendee is not a current AME member in good standing. Registrations may be canceled by January 31, 2019, with a full refund. Cancellations received after that date until September 8, 2019, will be refunded less a $300 administrative fee. After September 8, 2019, no refunds will be issued. Cancellations must be in writing and emailed to conference@ame.org, sent by confidential fax to 224-232-5563, or mailed to the AME office at the address above. On behalf of our host plants, AME may have to preclude some attendees from participating in plant tours due to the proprietary nature of some information presented. Attendees may be asked to sign a non-disclosure agreement (NDA) before participating in a plant tour.